During the nineteenth century, upstream diversions from the Gila River decreased the arable land on the Gila River Indian Reservation to only a few thousand acres. As a result the Pima Indians, primarily an agricultural people, fell into poverty. Many Pima farmers and leaders lamented this suffering and in 1914 the United States Indian Irrigation Service assigned a 33-year-old engineer named Clay “Charles” Southworth to oversee the Gila River adjudication. As part of that process, Southworth interviewed 34 Pima elders, thus putting a face on the depth of hardships facing many Indians in the late nineteenth century. Southworth’s interviews fell into obscurity until recently, when they were rediscovered by David DeJong. The interviews cover decades of Pima history and reveal the nexus between upstream diversions and Pima economy, agriculture, water use, and water rights. 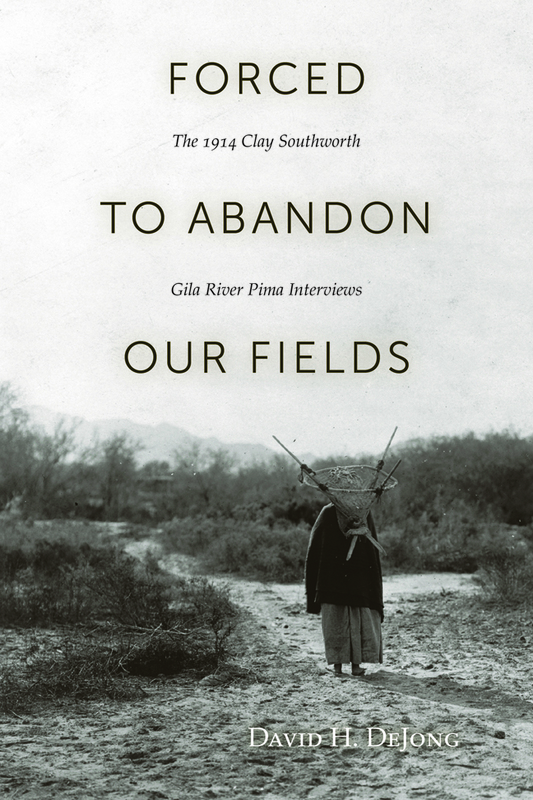 In Forced to Abandon Our Fields, DeJong provides the historical context for these interviews; transcripts of the interviews provide first-hand descriptions of both the once-successful Pima agricultural economy and its decline by the early twentieth century. These interviews suggest that it was not the triumph of Western civilization that displaced the Pima agricultural economy but the application of a philosophy of economic liberalism that prevented the Pima from building on their previous successes. David H. DeJong is project manager of the Pima-Maricopa Irrigation Project. He received a PhD in American Indian Policy Studies from the University of Arizona. "The interviews and other original sources, including photographs and translations of two calendar sticks as well as DeJong's overview of federal policies regarding Pima water, provide a historical context that continues to have vital relevance into the twenty-first century. DeJong presents a valuable contribution to the scholarship on American Indian history and encourages future research on natural resources and Indian communities."